From the moment you arrive at Signature Villa - Orlando, experience the upscale environment you know you deserve - why settle for less? You’ve worked hard, spoil yourself! Sink into high quality leather furniture; enjoy the air of opulence derived from beautiful, bespoke drapes and window treatments. Beautifully carved, solid wood furniture adds to that elegant dining experience. Why not enjoy our optional “Chef at Home” service for that special celebration meal or that long awaited family “Get Together”? A spacious but inviting family room and a separate elegant lounge provide all the space you need to take time out and relax. Enjoy the peace and tranquility of our South facing, extended heated pool and spa, overlooking conservation views and watch the setting of the sun from the privacy and comfort of our warm and soothing Jacuzzi. Luxuriate in the elegant en-suite bathrooms, no waiting for your ‘turn’, our home offers 3 bedroom suites with their own bathrooms and a fourth bathroom for the children. With a fully equipped games room, a 55” widescreen, HDTV (with upgraded cable program package) and DVD and HDTV's in all bedrooms and a PS3 and Wii games console, there is something to keep everyone happy! Snuggle down onto high quality pillow top mattresses, draping your sleeping form in cool, quality high thread count Egyptian cotton linens. Sleep soundly and wake refreshed to fully enjoy all the new day has to offer. WHy not spoil yourself a little more - take advantage of our optional Daily Maid Service! …and if you must, keep your “Finger on the Pulse” of the outside world with 24 hour wireless broadband internet access and free local, national and international phone calls. If you can tear yourself away from the peace and tranquility of our home, enjoy the on-site tennis and basketball courts and the full sized soccer pitch – all just a short walk away, great for working off those little moments of over indulgence! For the little ones - the two, close by and safely sited, ‘tot-lots’ are a really great facility. So why not experience all Orlando has to offer – great theme parks, great restaurants, golf, fantastic countryside and great shopping – all close enough for very easy access, but far enough away to escape to the luxurious haven our home undoubtedly offers. * dining room, kitchen, breakfast nook and full laundry room. * 3 sets of French windows, opening onto the pool deck. your keys - no need to detour for miles to pick them up! Baby cots, high chairs, strollers and bicycles all available to hire (for a very small charge) from our friendly villa manager who lives nearby. He will meet and greet you, arrange a welcome pack (if required) full of the basics foodstuffs needed on arrival. Games and DVD collection available for use by guests. Pool heat is availble - compare our prices! Well positioned house in a nice neighbourhood, close to all amenities and ideal for all Disney parks. The house is extremely well proportioned with beautiful decor, games room and a fantastic oversized pool and hot tub. We had 11 family members and we all could just lose ourselves within the house and chill out. The pool area is South facing and is a wonderful place to sit and either swim or enjoy a cool drink underneath the sun or the stars whilst listening to the all the wildlife. We had a wonderful time thank you. The villa was perfect in every way and if we return to Florida I will certainly be looking you up again. I hope Gary found everything in good order after we left. In response to your e-mail I am really struggling to find anything to say from a negative view point. Kids loved the pool and games room and their was everything in the villa that we could possibly need - fabulous. Once again thank you very much. Mark - Everything was wonderful! Disney World was magical - the best day was the one spent at Magic Kingdom and seeing the Christmas lights on the castle that night! The Villa was awesome - so spacious and homey. The welcome goodies were much appreciated (and totally unexpected); they made us feel like honored guests in your home rather than mere paying customers. And, yes, if we ever return to the Orlando area, we'd definitely want to stay at the Villa!!! And, we'd definitely recommend the Villa to others. Thanks for a great vacation!!! This house was fantastic. It was equipped with everything you could possible need. The owners and property managers were on top of everything. I was well informed before, during, and after my stay. The house was Very clean. I felt very safe in this area. Their were plenty of restaurants and grocery stores very close. We loved it and would definitley stay again. Thank you!! We had a fabulous time in Orlando and at your vacation home! It truly was one of the best accommodations that we have ever stayed in…lacking nothing!! Graham was very helpful and always willing to answer our questions. We own a motel and 8 rental homes on Ocracoke, North Carolina and we can only hope that guests feel the same way we felt while at your vacation home…right at home. When we make the trip back to Orlando we will definitely inquire about your rental home first!!! Thanks for sharing such a wonderful home with us! Thanks yes we are back to snowy Canada but it is good to be home too. We did have a great time in Orlando, lots of Disney but time for other things like the Harry P Leu Botanical Gardens - it is great if you have not seen it yet. The house was as clean as ever, we have stayed in many Orlando and Orange tree Properties and this is the best so far. 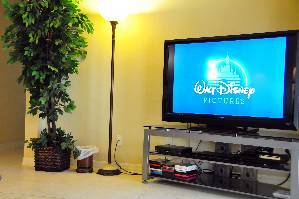 Great home close to Disney, well equipped, very clean and helpful management company. This was our second stay and we will come back! This is an awesome house. Everything you might need or want, it has. The furniture is contemporary and the layout is perfect for a large family or two smaller ones. I would highly recommend staying here. 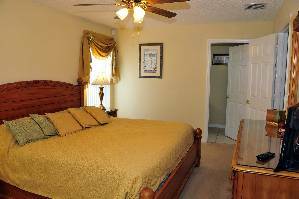 It is conveniently located to the Orlando airport and Disney World. The owner and house manager are pleasant and easy to work with. An over-all great experience. We had a fabulous experience at the Villa. From the gift pack at arrival ( never seen such a welcome ) to the extensively equipped First Class set up. Yes this was a beautiful home to us. It did not feel like a rental house . It felt like a home. The service from Gary was also to be commended. The house was furnished very warm and comfortable. The bedding and the comfort of the mattresses was the best that we have experienced ( much like our king bed at home) . We as a family felt totally at home and of course did not want to leave .. My son and his wife mentioned numerous times that that would like to extend their vacation there at the Villa not to mention my wife and I who could stay a entire winter. I cannot express enough the family warmth that we felt and the bonding that our family needed after the past few months. We again had a GREAT experience and would like to spend more time at 3418 Swallow Hill street.. In closing thank you for helping my family and I to experience a first class vacation experience..I thank you. Everything was superb and so clean and welcoming. Just wanted to drop you a line to tell you how fabulous your home was! Everything was superb and so clean and welcoming. The kid's couldn't get enough of the pool and we loved the hottub after long days at Disney. The amenities the house had were more than we could have ever imagined and the furnishings were exquisite! Orange Tree neighbourhood was so nice and quiet and the kid's spent hours 'hunting for the frogs and lizards' in the backyard. We had a peek at some of the other nearby homes and nothing could compare to yours. We certainly hope to come back again in a few years if you will have us. Once again, thank you so much for the hospitality and 'kudos' to the wonderful service from Graham and Gary too. We had a wonderful trip! Our party absolutely loved the villa. It was very clean and inviting. The layout was wonderful for a large group. We could spread out and get a break from one another to wind down after a long day of running. The children loved the pool and hot tub. They would swim every morning and evening. Everything was in order when we arrived and we couldn't have experianced a better stay! Our group had six adults and four children ranging from ten years old to seventeen. Again, thank you for sharing your wonderful vacation villa with us! I'd also like to add that the pictures truly represent the property. It was as lovely in person as it was in the pictures viewed at booking. We had a great Florida vacation and we loved the house. We could have stayed there all week and still had a wonderful, relaxing vacation! But since we bought Disney tickets, we thought we'd better use them! Disney was very close to the villa and it was great to come back at the end of a long day at the parks and rest in the hottub outside at night!!! The weather was absolutely perfect, sunny and 85 every day, not one drop of rain and no sweatshirts or long pants that we brought down from pa ever left our suitcases. 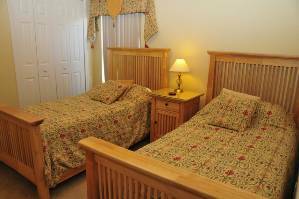 The beds were comfortable and the house was very new and inviting. We loved the private backyard (with no house right behind you). The kitchen was well equipped and saved us a lot of money over a hotel by making breakfast everyday and even eating some dinners there. There was plenty of room for the 9 of us and we enjoyed every minute we were there. Thank you for the welcome package with milk, bread, eggs, OJ, etc. It came in handy. With the washer and dryer there, I was able to drive home with all clean clothes and no laundry to do when we got back. I didn't want to leave. The managers were very great, friendly and helpful too! Hope we can go back someday! We really enjoyed our stay here, being met by the MC on arrival and the welcome pack was a nice surprise. 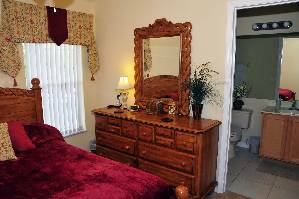 The location was great - Quiet and safe neighborhood, close to Walmart and Publix shops, and not too far to the parks. The house itself was fabulous, clean, comfortable and plenty of space for us. The Kitchen was well equipped and clean. The house has a great sized pool, not overlooked and lovely to get into after a hard day at the parks. We highly recommend the house to friends and family. We would happily return, overall an excellent stay. Mark I wanted to thank you for your excellent help. We loved the house, it was fantastic. Hope to come back soon. We had a great time. Everything was fine and we would definitely recommend yourselves / the villa to any friends looking for a holiday in Orlando. Everything was fine. There was plenty of room for the seven of us and everything is in good shape. The pool is great - larger that most or this type of home and nice privacy landscaping with a preserve view. Impressive for a rental. I would choose your house again on our next visit. Gary was nice to deal with. Your website really sells the house well. I would recommend this house to anyone. For a party of 9, we found that we all had privacy when we wanted, as well as a wonderfully designed public area to get together. 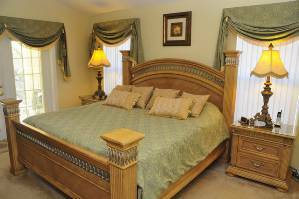 The furnishings are luxurious, the house was clean, and everything was in top shape. We had fun in the game room - in the garage, as well as the pool. The kitchen was better equipped than our own kitchen. We went to Disney in the morning and came home every day around noon, and then sometimes returned and sometimes not in the evening. We had not a single complaint on the house. In fact, my brothers and parents continued to congratulate me on the house reservation throughout the week. Finally, the owners/managers were always responsive and helpful. You can't go wrong with this one! We had a wonderful time and enjoyed your home very much. Overall the service was fantastic. One of the best times we have had in a home. Thank you, greatly looking forward to staying again in the future. Thank you for a wonderful stay. This is our second visit to your home. We enjoyed it so much 4 years ago, we came back for 2 weeks this time! The weather was hot, so the pool was a godsend at the end of a busy day. The welcome food was extremely thoughtful, and after a 17 hour drive, allowed us to rest, and not have to run to Publix until the morning. Thank you once again for opening your home to our family. See you again soon. When I show my friends and family my "Florida" pictures all they ask is "Where did you find that house?". Then they laugh when I tell them how I worried about what kind of place it would be. This gave new meaning to the word vacation. Everything about the house is perfect, including the location. I honestly believe that the house was a bigger hit with the family than Disney! We couldn't wait to get home and go swimming, cook a nice meal, play some pool and watch a couple of movies. There was nothing we wanted for. We were there with our son, his wife and two of our grandchildren so we would have required 2 hotel rooms. Staying in a beautiful house for the same money was they way to go for us. We thank you so much. You said that we wouldn't be disappointed and you were right. We look forward to coming back with more of our family next year. You are fortunate to have Helen to welcome your guests. She is very sweet and concerned that everything is perfect. Thanks again for giving us our monies worth. This was our first stay and it was spectacular. My husband and I have done a lot of traveling but this house had it all. We took our children and their children and they had never stayed in anything but a hotel room. They all loved it. It was great having the game room and also the pool after a day at disney. We just got back and we have already booked again for next year. We stayed at this villa for two weeks in April 2006, and it was a fantastic holiday! The villa is beautiful, spacious, with extremely comfortable beds, and the best equipped kitchen we have ever come across. The highlight was undoubtedly the large pool and jacuzzi overlooking a conservation area - a big hit when returning from the theme parks. We really appreciated the excellent service we had from the owner, Jane, and the management team. Staying at this beautifully furnished villa made for a wonderful holiday! Mr and Mrs. Price's Signature Villa was excellent - our gran parents, parents and kids loved it! Thanks a million and we reccommend this to anyone who can drive and will rent a car. Great location near supermarkets and shopping centres. 15 mins to atractions. Great managment company - Steve and Rose! Villa has everything you need in the house - from pool table to cake baking! Try it! We just loved this house. It had everything you could ever imagine in the kitchen. There were 9 people in our group and you would never ever know it, by the size of the house. We were extremely comfortable and the rental staff that was on-site was not only professional, but friendly too. The pool was used after long days in the parks by the kids. And, the jacuzzi was great for the adults. You may think the game room would never be used on your vacation, but you would be dead wrong. We spent many nights having air hockey and pool tournements!!! My family and I are looking to rent this house again next year. I would highly recommend renting this home to anyone who has a large group of people. After a long day at the parks, it was really great to go home for a swim and use the grill for dinner. I don't think we even used the dining room. Enjoy. My family and I stayed in Jane's beautiful home during Easter 2005. Her is home is very welcoming with beautiful furniture. Our expectations were over met. Her home made our stay in Orlando that more special. The pool and Jacuzzi are really nice especially after a long day at Disney. It is in a great location and is easy to find. All interactions with Jane, before, during and after our vacation was excellent. We would definitely recommend this home to all of our family and friends and look forward to staying there again sometime in the future when we return to Orlando. 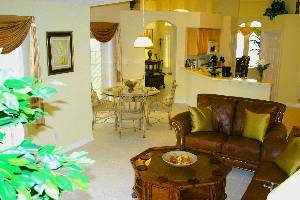 This villa provides the perfect place to relax away from the hustle and bustle of the Disney parks and we would highly recommend it to other families looking for a taste of luxury. The well-equipped villa exceeded our expectations – we only wish we’d had longer there to enjoy it. As a party of five adults and five children we found the property was more than able to accommodate us all. It never felt like there were too many people in one house as the rooms are spacious and the outside space is excellent. We made full use of the pool and Jacuzzi, in fact some of our favourite days were spent chilling out at the villa watching the children having fun in the pool. The adults enjoyed a glass of wine in the Jacuzzi in the evenings or a game of pool in the excellent games room. The villa is ideally located in a very quiet community and the pool has a lovely view and is not overlooked. We spent hours trawling the internet looking at villas before our holiday and found it almost impossible to make a final choice. However, Jane and Alan Price’s home stood out, not just for the luxury it offered, but because it represented outstanding value for money. We would have no hesitation in recommending this villa. Jane and Alan Price have equipped their home with everything you need – and much more – and the couple will go the extra mile to make sure you have the holiday of a lifetime. Prior to our trip, all queries were answered promptly and they genuinely care that you have a good experience in Orlando. We would love to return one day. Anne Michael and Family, High Wycombe, Buckinghamshire. My family and I have just returned from a two week stay at this fabulous home. The house was better than 5 star in my opinion. They have every kitchen gadget you could possibly need and more, even hair dryers in every bathroom. This was the perfect home for our vacation. For quite some time we wanted to vacation in the Orlando area, but we were unsure about whether to stay on Disney grounds or close by the attractions. We definitely made the right choice staying close by at the Price’s home. It was exactly what we needed. Especially after long days at the parks and fighting the crowds, the privacy was wonderful. The pool and spa were most relaxing at the end of the day and we didn’t have to share it with others. The house is located in a very peaceful neighborhood, perfect for taking walks and enjoying nature. Every afternoon that we were out at the pool, we would get a visit from these big, tall birds (sorry I do not know their proper name). There were two mothers and two babies and they would walk around the backs of the homes every afternoon. My children looked forward to these birds and would give them bread at every visit. The games room was an added plus in my opinion. The children, and even the adults, spent many hours in this room involved in some clean competitions. By the end of our stay, our son was beginning to give us a run for our money at pool. A big “Thank You” to Alan and Jane Price for sharing their home with us. When we decide to come to Orlando for another visit, we will most definitely stay at this home again. The Shearer Family from York, Pennsylvania. Low Season (2012) ........ $1330/week Including taxes Mid Season (2012) ........ $1505/week Including taxes High season (2012).......... $1540/week Including taxes Christmas (2012)........... .. $1610/week Including taxes Low Season (2013) ........ $1330/week Including taxes Mid Season (2013) ........ $1575/week Including taxes High season (2013).......... $1680/week Including taxes Christmas (2013)........... .. $1820/week Including taxes Pool & Spa Heat $25/day - Daily Maid & Chef at home services - Optional For stays over 14 days,a 10% discount is given Credit card or PAYPAL, personal checks, bankers drafts and wire transfer. Note: Until confirmed, rates are subject to change without notice. Other Fees: Stays of under 4 days include an additional $120 cleaning fee.